Local Lake Stevens roof cleaning company. We are your neighbors. Roof repair and replacement is huge expense and terrible inconvenience that most people would rather avoid. There is one crucial step that you can take to extend the life of your roof and protect it against premature deterioration - regular roof cleaning. Lake Stevens residents have come to rely upon Apex Pressure Washing to provide exceptional roof cleaning services. Our team of experienced, trained experts know how to properly and thoroughly clean any type of roof. Plus, as a locally owned and operated company, we are very familiar with how the particular environmental conditions in this part of Washington can affect your roof, and we know how to protect against them. This also means you will see us in line for rides at Aquafest next to you, and at the boat launch in Lake Stevens too. Being a locally owned and operated company, you can rest assured that when you do business with us, your money stays in the community. In addition, our extraordinary customer service simply cannot be beat. Our courteous, friendly and knowledgeable staff is always on time, never rude, and always willing to answer your questions or address your concerns. We take pride in our work, and if you're not satisfied for whatever reason, we'll do everything in our power to make it right! If done incorrectly, pressure washing can actually cause damage to your roof, and the chemicals used in some types of cleaning solvents can cause staining or fading on certain types of roofs. We are proud to have highly trained technicians with a lot of experience. We are proud of our team and our clients are pleased as well. (Ask us for references!) 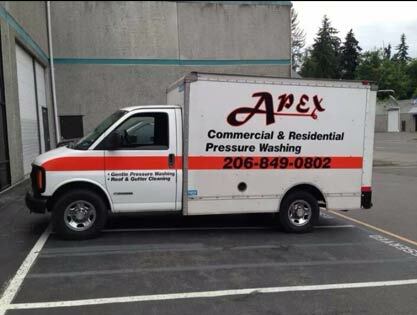 With our top quality equipment, specially designed cleaning solutions, and expert techniques for pressure washing, Lake Stevens homeowners can rest assured, with the Apex team on the job, that you won't have any damage, fading, or staining. All you'll have is a roof that is thoroughly clean and looking great! At Apex, though, we don't stop at professional roof cleaning. In Lake Stevens we have a unique microclimate and weather conditions can wreak havoc on other areas of your home as well, such as driveways, patios, walkways, decks, and siding . Since we're experts in all types of pressure washing, Lake Stevens residents can rely on us to take care of these areas, too, removing dirt, grime, mold, algae, and other matter that eats away at these types of surfaces. Not only will regular, professional cleaning of these surfaces beautify your home, but it will extend the life of these areas, saving you money in costly repairs or replacement, and improve your curb appeal. Whether cleaning a driveway, pressure washing a patio or performing expert roof cleaning and pressure washing, Lake Stevens residents deserve the bestand we're prepared to deliver exactly that! No job is too big or too small, and we offer the same, high quality service no matter what project you have in mind. To learn more about our services, or for a free estimate, call us today. And don't forget to ask about our periodic specials! Contact Apex Pressure Washing today.